He as a mighty hunter before the LORD; that is why it is said, "Like Nimrod, a mighty hunter before the LORD." A sublime example of Elgar’s multipronged wordplay hinges on his use of the biblical name Nimrod for Variation IX. That elegiac movement portrays his German friend August Jaeger, a devoted champion of Elgar’s music at Novello & Company. In German Jaeger means hunter, and Nimrod is described in the book of Genesis as "a mighty hunter before the LORD." At first glance, the hunter reference appears sufficient to explain Elgar’s peculiar choice of nickname. Virtually everyone concludes their analysis with that cursory explanation. However, there is far more to this puzzle to excavate. The discovery that Ein feste Burg (A Mighty Fortress) is the covert principal Theme to the Enigma Variations exposes Elgar’s multifaceted wordplay in bestowing on the ninth variation the title Nimrod. The covert theme’s common title is three words long, and remarkably the first two are "A Mighty." Elgar's overt scriptural reference conveniently offers in order the first two words of the absent theme's title. 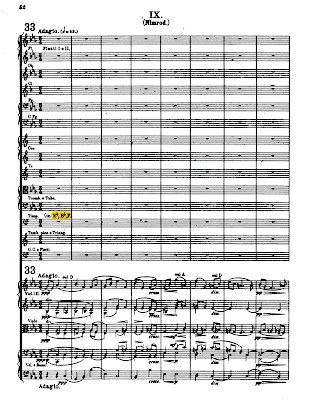 In the orchestral score for Nimrod, the tuning of the timpani is shown as E flat, B flat, and F. Remarkably, those letters are the initials for Ein feste Burg. Nimrod is mentioned by name in Dante’s Divine Comedy, and by deed in Tasso’s Jerusalem Delivered. Elgar makes various allusions to Dante's famous epic poem in the Enigma Variations with Variation IX serving as an excellent illustration because Nimrod is described by Dante as inhabiting the ninth circle of Hell. Elgar penned a paraphrase from Tasso's epic poem at the end of the original score. In Jerusalem Delivered, Tasso describes Nimrod as a rebel who spearheaded the construction of the Tower of Babel. 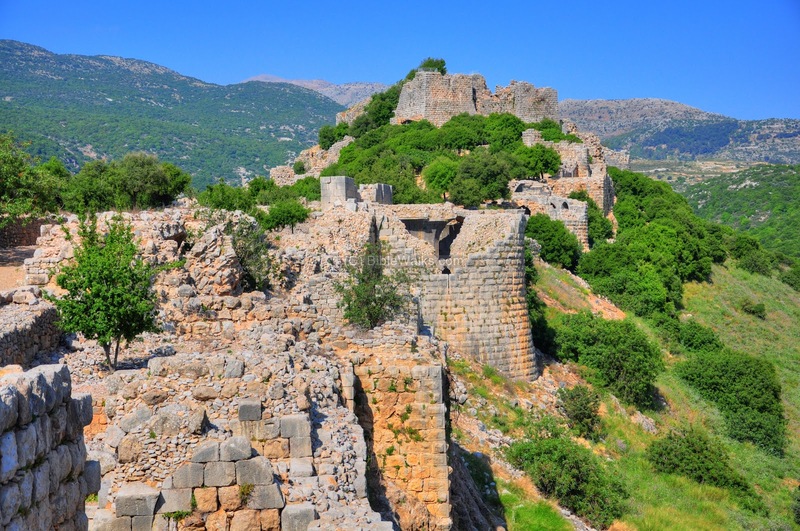 In the Old Testament Nimrod is portrayed as an architect of fortified cities – fortresses. His reputation as a builder is so well established that a medieval castle on the northern slope of the Golan Heights is known as Nimrod Fortress. A rather cursory analysis of the meanings attached to the name Nimrod makes it relatively easy to cull together the title A Mighty Fortress. Since the movement is dedicated to Elgar's German friend, this calls for translating the English into German from A Mighty Fortress to Ein feste Burg. With one famous title, Elgar cleverly hints at another. Further evidence in support of this wordplay cipher is provided by Mendelssohn's version of Ein feste Burg played "through and over" Nimrod. As a token of his gratitude, Elgar gave a copy of Longfellow's Hyperion to the conductor Hans Richter who conducted the premiere. In the pages of that little novel, Longfellow mentions Luther and his sublime hymn A Mighty Fortress. No wonder Elgar thought the hidden theme would be quickly discovered, for he literally gave away the answer. Just the opposite was the case as the search lingered for 109 years before Ein feste Burg was unmasked as the mysterious missing melody on the bicentennial of Felix Mendelssohn's birth. …As to myself the following are F A X about me. 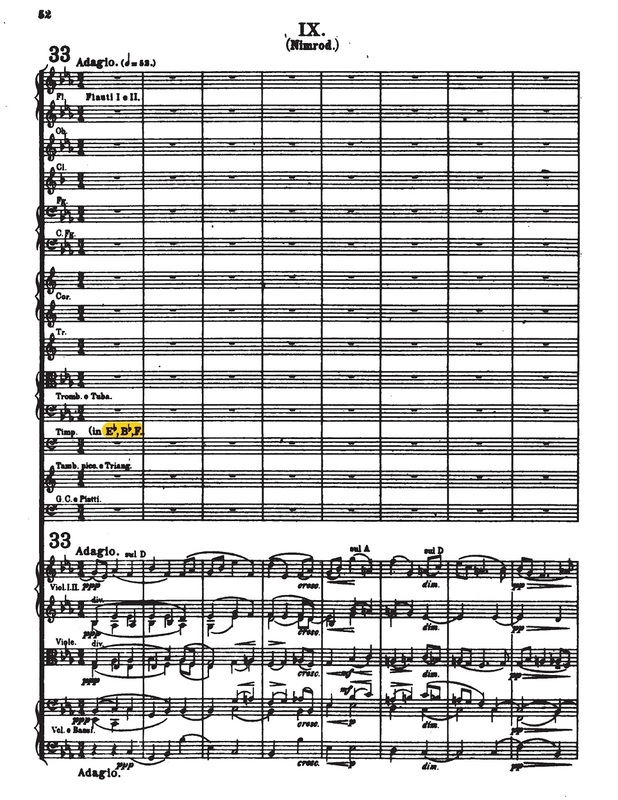 Just completed a set of Symphonic Variations (theme original) for orchestra – thirteen in number (but I call the finale the fourteenth, because of the ill-luck attaching to the number). I have in the Variations sketched portraits of my friends – a new idea, I think – that is, in each variation I have looked at the theme through the personality (as it were) of another Johnny. By refracting the Enigma Theme through the personalities of his friends, Elgar generates a musical kaleidoscope of tone colors and textures. Like the confusion of tongues, the Enigma Variations are a metaphorical "confusion of notes" that conceals a hidden source melody and propels each variation off into new styles and directions. Every movement conveys a distinct musical language reflecting some trait of a friend pictured within. In a stunning parallel within the Enigma Variations, Nimrod is followed by Dorabella, a movement in which Elgar pokes fun at a friend's speech impediment, Dora Penny's stutter. Is this not an exquisite musical metaphor for the confusion of tongues symbolically and suitably placed immediately after Nimrod? 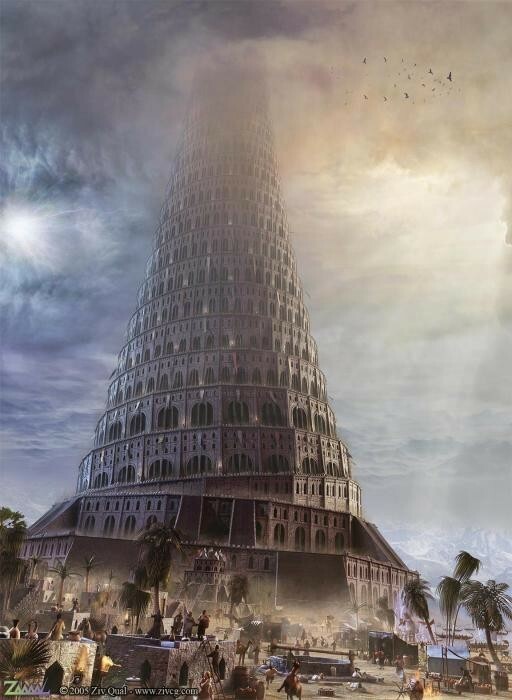 The description of Nimrod's most famous architectural project as the Tower of Babel contains a distinctly English element, one at the heart of Elgar's British heritage and enigma wordplay. 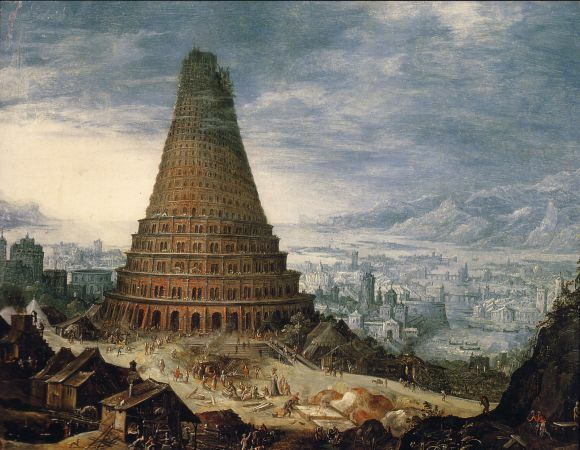 It concerns the first two words of the phrase, "The Tower of Babel." There is a famous castle in London known as the Tower. Built by William the Conqueror following his successful invasion of England in 1066, it is officially known by the six-word title Her Majesty's Royal Palace and Fortress. For the sake of this analysis, the keywords are tower and fortress. The hidden melody to the Enigma Variations is commonly known as A Mighty Fortress, but William F. Bunting translated it as A Strong Tower. Both the terms fortress and tower are linked to the missing theme's title. Elgar's ingenious wordplay built around Jaeger's nickname subtly and elegantly implicates Ein feste Burg. There is a giant connection between Nimrod and the covert Theme. Like Tasso, Augustine describes Nimrod as a "gigans" – a giant. 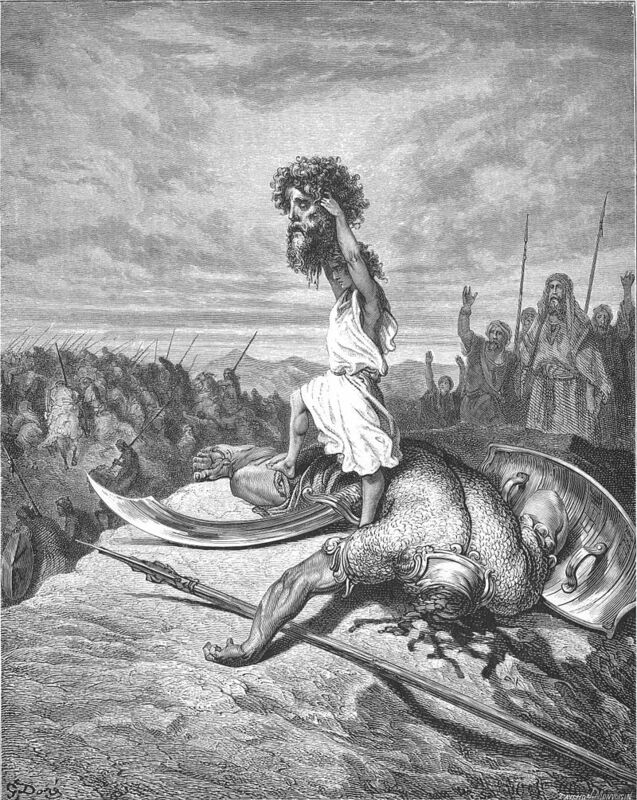 Another famous giant from the Old Testament is Goliath who fell before a youthful David. Besides being a mighty man of valor, David was an accomplished musician who composed the Book of Psalms. So what is the giant connection between Nimrod and the covert Theme? The title of Martin Luther's hymn Ein feste Burg originates from Psalm 46. To learn more about the secrets behind one of Elgar’s most celebrated symphonic achievements, read my free eBook Elgar’s Enigmas Exposed.